Today’s complaint: Skyward Sword is going to be little more than a glorified Wii Motion Plus advertisement. Its gameplay will be based on gimmicks rather than the core fundamentals that define the series. Software direction should be based on what will make the software strong, not the “tricks” that are possible with new technology. It’s certainly a valid fear. A motion-heavy game could very well discard a number of the series base elements in favor of completely different gameplay. 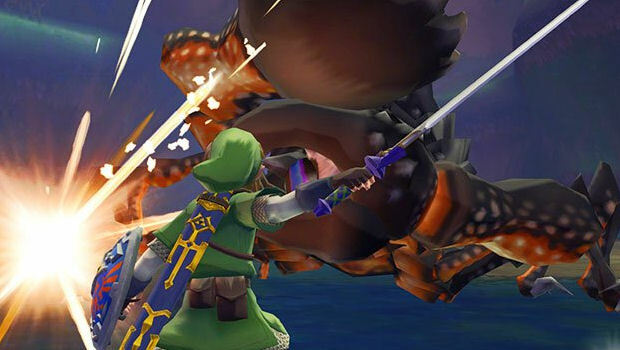 And the trailers we’ve seen so far have shown essentially only demonstrations of Motion Plus functions rather than things like dungeon and field investigation, environments, and other “content.” I could understand a casual onlooker perhaps thinking that the new Zelda is going to be all about motion controls, but for longtime fans to think that this means a drastic change in the quality of the game content just doesn’t make sense to me. We can see from Aonuma’s initial hesitance to implement Motion Plus controls before they got fine-tuned for Wii Sports Resort that Nintendo is less concerned with using their fancy gadgets than they are with making something that people will enjoy. Rather than Skyward Sword being made to sell Motion Plus, I get the sense that they are trying to use Motion Plus to enhance Zelda‘s core gameplay like they did with the jump to 3D graphics in Ocarina of Time. That is not to say that the final product isn’t going to be built with Motion Plus heavily in mind, or that there won’t be a few motion tricks here and there like the “puzzle cube” or “eye door” from the footage we’ve seen so far, but by and large the use of Motion Plus seems to be focused on advancing the core fundamentals to the next logical step. 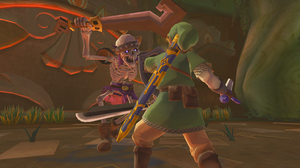 Pictured at left: This is a prerelease shot of a Zelda game. Pictured at right: This is also a prerelease shot of a Zelda game. That’s why almost everything we’ve seen so far has taken the form of updated controls and functionality for items that play a direct role in either combat or progression – improved swordplay, projectile aiming, bomb targeting, and so on. So far we haven’t seen any completely distinct functions aside from the puzzle cube key, and I don’t think anyone can really argue that such a thing doesn’t fit in an adventure game – weird keys and strange mechanisms are pretty common features in your stereotypical ancient temple. There’s no evidence that the addition of Motion Plus is going to mean radically different gameplay; rather, it means that they’re working on fleshing out the way we do the same things we’ve been doing for years. 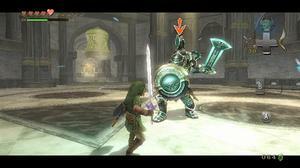 Really, it’s no different than the initial stuff we saw for Ocarina of Time. Oh boy, it’s The Legend of Zelda…in 3D! There was nothing really exciting about any of the footage, which was mostly of cutscenes rather than actual gameplay, except the shiny new graphics. Now we’re getting The Legend of Zelda…with a full range of player control. We’re actually seeing applications of new gameplay functions as opposed to mostly out-of-play footage – and people are complaining that the trailer is boring and just shows off a bunch of Motion Plus gimmicks? because I honestly don’t see it. Is there anything about that commercial that really sells Ocarina as a must-buy that Skyward Sword can’t compare to? And I know it’s a subjective matter, since it’s all about preference, but I just can’t buy this idea that what we’ve seen from Skyward Sword is a disappointment in comparison to previous games.